This painting shows the three species of cuckoo that are in the genus Coccyzus, and are found in North America. 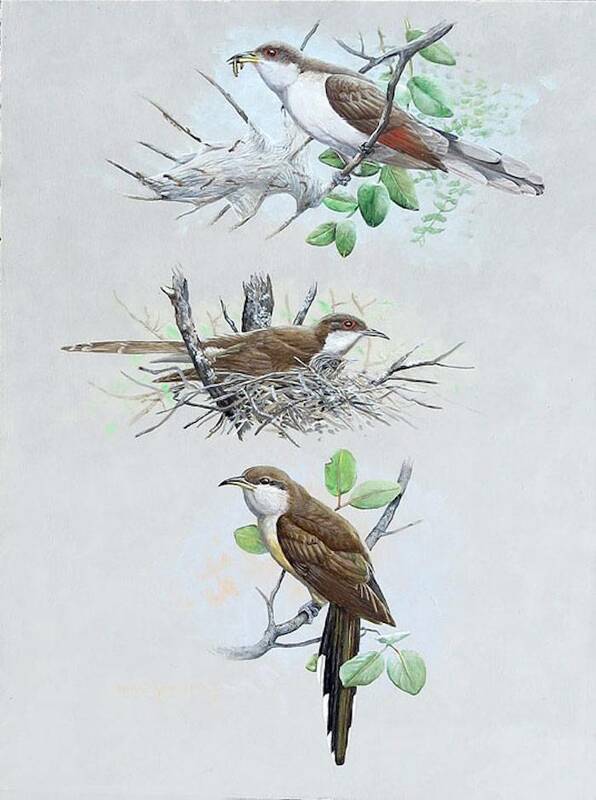 At the top is the Yellow-billed Cuckoo (C. americanus), and below it, is the Black-billed Cuckoo (C. erythropthalmus) and at the bottom, the Mangrove Cuckoo (C. minor). When I was young I was enthralled by the large bird books of that era, many “state” books, or books about the birds of a large region or country, featuring paintings by early 20th century artists in which related bird species were shown in a single painting, often beautifully done by such influential artists as Allan Brooks, Louis Agassiz Fuertes, Walter A. Weber, Francis Lee Jaques, George M. Sutton, Owen J. Gromme, Donald Leo Malick, Archibald Thorburn, Don. R. Eckleberry, Roger Tory Peterson, and others, including the master of them all, D.M. Reid-Henry. That style of painting, mostly done in gouache watercolor (acrylics were not invented) has somewhat fallen out of fashion (while great bird artists whose work I greatly admire continue to appear), but I love to pay homage to that type of “composite painting”, as I call it, as I’ve done with this painting. There are nine species in the genus, the remainder found in Central and South America. The Yellow-billed has a wide range across temperate North America, from California to the Canadian Maritime provinces. It winters in South America (some migrating through the West Indies) where the very closely related and very similar Pearly-breasted Cuckoo (C. euleri) has a wide distribution. Cuckoos are among the few birds that eat fuzzy caterpillars, often dining on tent caterpillars, oblivious to the spines that irritate most other birds. Unlike many cuckoo species (there are about 136, world-wide) “ours” make their own nests (if not very substantial) and incubate their own eggs, so I showed the Black-billed on the twiggy, platform nest with the head of one baby showing. The feathers of neonate cuckoos develop in plastic-textured sheaths, as with all feathers, except the sheaths grow longer before the feather erupts at the end, than is true of most other such birds (excluding, of course, those that are downy when hatched) giving the babies a sort of hedgehog-like look. The Mangrove Cuckoo reaches the northernmost tip of its range in extreme southern Florida, but has a wide, mostly coastal range in the West Indies, Mexico and Central America and the Caribbean and Atlantic regions of northern South America. 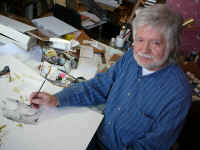 The painting is 24 by 18 inches, and is done in acrylics on compressed hardboard.